In this ever faster changing world, organizations have to adapt quickly to changes in the market or its environment. Business integration, within one or between multiple organizations, is one of these changes imposed on organizations. In some cases, information and communication technology (ICT) is an enabler of an effective and efficient integration, but in other cases, ICT is one of the reasons of failure to this integration. 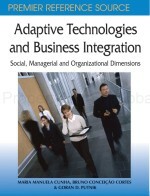 In this chapter, a holistic approach to align ICT capabilities with business integration is proposed. In this proposal, a broader perspective is taken in which not only ICT, but also cultural and social aspects, are taken into account.